This piece was originally composed by Frédéric Chopin as an étude for solo piano. It is a slow cantabile study, and marks a significant departure from the technical virtuosity required in études before Chopin's time. It concentrates on melodious phrasing and legato ambiance of performance more than technical skill. It has been classified as a tone poem for piano by some critics, and is highly regarded as a quality manifestation of Chopin's love for Romantic opera and Poland, where he was born. In all my life I have never again been able to find such a beautiful melody. 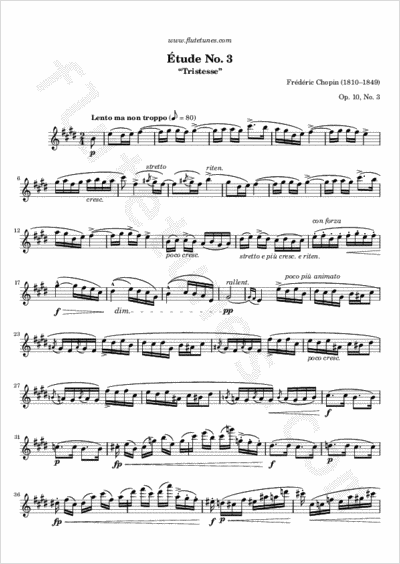 This Étude is also known as “Tristesse”, meaning “sadness” in French.